In this week's reading, in addition to learning about the southern departures of the book's main characters, we also learn of departures of families that included children such as Huey Newton and Bill Russell, who would later become famous for their contributions to the Black Panther Party and the National Basketball Association, respectively (186-187). 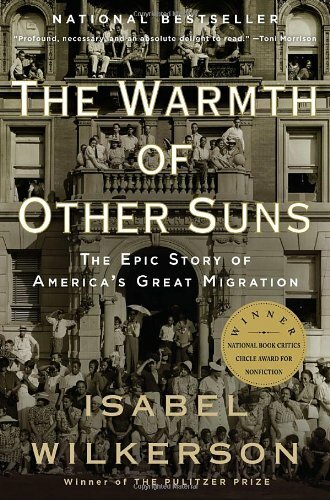 In the section, Isabel Wilkerson also describes the processes and experiences of people traveling from the South to various other places across the country. After reading the pages 181 - 204, what scene concerning southern departures or travels to new destinations did you find most notable or memorable? Why? Please provide page number citation. I found the most memorable aspect of southern departures on pages 189-190. Ida Mae adressed how her and her husband did not even breath a word of their plans to anyone, not even family. To do so could risk them being found out and punished. Everything was kept so under wraps that families were seperated without even a goodbye which I find so heartbreaking that that had to occur. The scene I found most memorable regarding departures to new places was located on page 192. George Swanson Starling was the man whose story was told in this section. "On the railroad, the Jim Crow car was usually the first car behind the coal-fired locomotive ...It was the car that would take the brunt of any collision in the event of a train wreck." Luggage and blacks were seated in this car which stunned me. Their lives didn't even matter enough if the train was going to crash, they would go down with the material items of the passengers.It makes me realize how far history has come and the fight that still exists for equal rights among all races and to be treated fairly. While reading this particular section of "The Warmth of Other Suns" a notable departure scene was the story of the great Bill Russell. The struggle that him and his family had to go through in the early stages of his life, undoubtedly motivated him to perform at the highest level on the basketball court. I found the description of the lines where Jim Crow was in effect and where it wasn't to be pretty interesting (pg.199-200). Not only because it was the dividing line between freedom and oppression (though even in those areas where segregation wasn't law, racism still existed) but also because as soon as they hit that line, the blacks could move up in the train cars (pg.200). It's also interesting to note because the dividing line in Illinois was Cairo, which is the southernmost tip of the state, yet there are still remnants of segregated schools in Edwardsville. Something that stuck out to me was on pg. 197. It talks about how there was limited sitting for black people in the dining car, so much so that lines would be several cars long with only four seats available. Not only where black people packed in with the luggage, but it was like they weren't expected eat for the entire trip. "Luggage doesn't need to eat," was probably the white mindset of the time, if they even bothered to put that much thought in the matter. I found Ida Mae's account of her travels to be the memorable to me. I thought it was so brave of her and her husband to leave the south and travel up north knowing that she would have to leave everything and everyone she had ever known. It just shows the resilience and courageousness of blacks during that time to leave their homes and go up north for a better life. George Swanson Starling's (p.192) was the most notiable to me. He talks about how the Jim Crow laws placed them in the first car along with the luggage of the white people because if anything dangerous is going to happen, it will happen to them. It just really shows how dispensable the white people think they are. Their clothes either have the same value as the blacks did, if not more. I found the story of Pullman porters smuggling the "Chicago Defender" on page 191 to be most memorable. Even though this colored newspaper was banned in the south, people still tried to get the newspaper around. The "Chicago Defender" described the possibilities blacks could have in the north and helped inspire many blacks to travel north. I think it's incredible that people were willing to put themselves at risk, in order to get the "Chicago Defender" out and inspire other blacks to travel north. The scene that was most memorable to me was the story of Robert on pages 192-196. The story talks about how Robert is driving through Texas and had no place to stay. He also has the fear of having car troubles in the rural west of Texas, because there is no way to get help immediately. Just to think of how much more of a struggle black people had to go through versus white people is absurd. If any hotel in Texas would of allowed colored people it would of made Roberts trip a lot easier. The part I found most memorable was on page 195. It describes how many cars were broken down on the side of thee road and towns were slim. It could be dangerous of you broke down and had an emergency. Traveling can be full of possibilities and excitement, but at the same time it can be scary. There is a lot at stake. The scene I found most memorable was on pages 186-187, when Bill Russell’s mother and father where treated badly when he was younger. I thought this was very interesting because I haven’t heard a lot of stories like this about famous people and what they went through during this time. It just goes to show that this type treatment literally happened to anybody. I thought Bill Russell's story was the most intriguing (pgs 186-187). Before reading this I only knew Bill Russell for his reputation in the NBA, never would I have known what kind of life he had growing up. It was very aggravating to read about the things that happened to his mother and father. And I thought the line that read "There is no way to know what might have happened to Bill Russell if his parents had not migrated" (187) that is so true! -JaLeah M.
The pages I found the most memorable were from 191-196, which basically talked about the fear that Blacks would have during this time. The fear of traveling and having a car break down, without having any idea who would help or who would hurt them. But, it showed that for Robert and his family, that they were determined to make the trip up north to find themselves a better life. That is a huge testament to the hundreds of Blacks who took it upon themselves to separate themselves from a bad environment and take a leap of faith and travel north. One of the most memorable stories for me was the one about George Swanson Starling. (192) He talks about how the black passengers on the train had to sit in the baggage car. Him and many other blacks had to ride in the Jim Crow car which was the car directly behind the coal-fired locomotive. In the case of a head on collision, their car would receive the most damage. Its sad learning about things like this, realizing that back then their lives were less valuable than luggage. I think it's sad that the secrecy of departure left so many families broken. Even worse than this, the families had not the privilege of saying goodbye to those loved ones. Ida Mae's talking about this (page 189) really was saddening, because they were trying to find a better existence and that existence didn't include those they left behind. 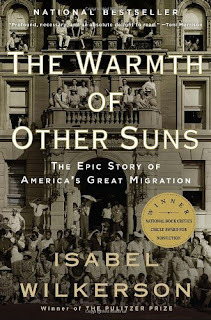 Would stood out to me the most while reading was the uncertainty the persons of color had to deal with this migration. It is also interesting to see how infamous events in American history impact famous people. I have known for the longest that Bill Russell was a legendary basketball player. It is so hard to think that such a person's family would have to deal with such a hard life growing up, but it is definitely apparent. An incident where a police officer forced Russell's mother to take off a suit for dressing too much like a white woman occurred (pg 187). I could never imagine such things happening to other human beings, and it truly humanizes someone who is a celebrity - knowing that they have experienced such things. The scene that I found most memorable was that of Robert Joseph Pershing Foster (pg. 193-196). It is memorable to me because, while the others were taking many risks as they traveled by train, I felt Pershing's mode of travel, driving alone, was possibly the most perilous for a black person at the time. I also realized how much we take for granted now. For example, the author described how Pershing had no way of knowing when there might be a safe place to rest his head for the night or if it was even safe to pull up alongside another car at night. Today, a black person may not feel completely safe everywhere, but at least we always know we are guaranteed something as simple finding a hotel to rest in. On page 192, it talks about how black people were made to sit at the front of the car so that they would take the brunt of any crash or damage along with the luggage. This goes to show just how reluctant white people back then were to change. Even under the guise of freedom, they still tried to find ways to show black people they were were less than, trying to equate them to luggage, putting them at the back or front of transports as it suited them. On pages 187-189, I found Pershing's experience most notable. In particular, I liked the sense of identity that came along with this scene. In the reading, names and identities was discussed and that names were the first and maybe only thing a child could be given by a colored parent. Relocating and starting over completely is not often an opportunity within someones lifetime. I really liked the idea that he shortened his family given name, but added a new twist. This not only emphasizes a new found sense of freedom but also the fact that we should never completely forget where we came from because it often sets us up for the kind of person we are going to be and where we are going. The most memorable part of their departure was "Every fifty or sixty miles, you saw a crippled Hudson or Pontiac, overheated, engine trouble, out of gas. It reminded you of the treachery of it all and how lucky you were to still be moving" (pg 195). This stood out to me because it was something that I could most relate to. I remember being a kid and going on a trip with my mom, but we were broke just like our car. It was always a gamble if we were gonna make it to where we were headed, and even more of a gamble to get someone to come get us if we didn't make it there. While I was reading this section of the book, I could really place myself in their situation, except for the danger of being killed by southerners. On page 184, what I found most notable was how the colored people traveled on the train. It was stated on this page that George and his family traveled with the baggage, fried chicken and boiled eggs in the Jim Crow car from Mississippi to Okolona. It was notable to me because they bought train tickets just like everyone else, but was made to sit in seperate cars on the train. I have so much respect for them. They did what they had to do to get where they needed to go. I couldn't imagine going through that in this day in age. They wanted to live a better life and they did what they had to do to make that happen. The part I found most interesting was the way they treated the blacks in the cars during transport. I believe it was on page 198, but the blacks on the ride were basically treated as inanimate objects and receive no respect. It was so bad that they didn't even have enough seating to enjoy a meal while on the train. And it just becomes even more mind blowing that the amount of seating for the extremely long lines for food, was in the single digits. A very shocking scene for me was the story of Bill Russell's parents(186-187). We usually hear about the most terrible ways in which Blacks were treated—lynchings and segregation—and even though the stories we hear about are evoking of emotion, it was just shocking to see the simplest ways Blacks were mistreated and abused. To be told by a white man to wait for all the whites to be serviced and not being allowed to leave and to be told by a police officer what to wear so as not to dress like a white person. It just seems so outrageous. The most memorable scene for me was on page 184. This is when they are talking about Ida Mae and their family moving from Chickasaw County. My family travels all the time, so I could relate to having to pack tight in a car with bags and food. However, when it said they were leaving the state of Mississippi for the first time, that was somewhat shocking. It made me think if maybe poverty or Jim Crow were keeping people confined to their own neighborhoods or spaces. To leave the only life you knew had to be incredibly hard for African-Americans at the time. But then again, they were leaving Jim Crow--lynching, segregation, etc. The scene that I found most memorable is on page 197. The author talks about how there was no guarantee that the black passengers would get anything to eat during the ride,and that they had to bring cold food in shoe boxes just in case. This is memorable to me because it's crazy to think about how people can watch others suffer and struggle and not have a care in the world that their privileges are affecting another human beings life. The scene that I found memorable pertains to the concept of blacks being lesser than whites. There were points made that blacks were either equivalent to baggage and sat in the most rear part of the train or they were right up front in order to take the bulk of impact if there were to be an accident. It is disappointing to see how much whites were reluctant to give blacks the rights they deserved. Even after all they had been through and how far they were coming, whites always managed to find a way to diminish and devalue blacks. The account that I found most memorable was the one regarding George Swanson Starling on page 192. He elaborated on how the black passengers had to ride on the car behind the coal-fired locomotive. He specifically talked about how if there was a collision, that car they were seated in would obtain the most impact. What was also disappointing was the fact that they were seated in the cart where luggage was placed which explicitly expressed the lack of respect and neglect they received during this time. On page 189 and 190, Ida Mae tells her husband not to say a word to anyone. This stuck oit to me because leaving the south should be joyous and a happy moment, but becuase of jim crow and the whites control on the blacks it is actually a very scary moment. They have to be very careful by not telling anyone showed me that this was dangerous and if they got caught they could be in even more trouble. (Sorry I got cut off) into small amounts of anything they could fit into a paper bag. I own several items that I hold dear to my memories and heart and having to limit my possessions down to the capacity of a paper bag would be difficult and troubling for me. The most notable moment in this chapter for me was when they discussed how black people named their children. The author talks about how black people would "recycle" names of people that were family, so instead of calling them by their 3 or 4 names, they would be nicknamed. Also, I thought it was interesting how naming a child was really the only thing a black person had control over. I like how black people used it to their advantage. It was funny to me that a white person would not call a black person "Mrs. or Mr.," but would be forced to call them their name...even if that meant calling them "Queen" or "Colonel" (188-189). I found p.200 to by very interesting. Although slavery was over, blacks still had to pay very close attention to the way they acted and interacted with the people in different areas. Not just while traveling but on a day to day basis. Some people people where more tolerant than others although not by much. White people to a much smaller extent had to be knowledgeable of how segregation worked. I enjoyed the section discussing the long drives beginning on page 194 and continuing on until page 196. The quotes within this account really paint a picture of how difficult it was to find safety, security and a sense of stability. I found these quotes in particular very captivating: "The eyelids grew heavy, and the road seemed to blur. He would look for safe place place... He would have to keep himself awake until he found such a place" and "If you got stranded, you could only sit and hope that help arrived before the next meal." I can't imagine the helpless feelings that come with not being able to stop at a hotel, or having access to phones or the fear of not receiving emergency help when I need help. This section among others gave me a sense of the angst and fear that accompanied an "exodus" of sorts. I found Ida Mae's story on pages 189-191 to stick with me the most. It was so dangerous leaving that they did not tell anybody of their plans. It is shocking the lengths they had to go to to fight for and to get to "freedom." Her story showed the details of getting to "freedom" from the south. We have truly come a long way from those days. What stuck with me is on page 197-198 when they described the conditions of where colored people were on the train. This stuck with me because I thought about how much we complain day to day and we don't realize had we just been bored a few generations earlier we would have it worse. On page 195, the author described that breaking down in a white neighborhood. If this happened, it was dangerous for the Blacks and there was a possibility that they would be harmed and not find help at all. I can relate to this because I have been in places that are dangerous for non-white people to get out and feel safe. The most notable migration, to me, was on pages 186-187. The way Bill Russell's family was treated had a great impact on the man he had become. I cannot possibly imagine how hurtful it would feel to have to take off a suit you spent your hard earned money on because you "had no business dressing like a white woman". I applaud his family and many others for finding to courage to migrate and seek better living standards. The most notable scene occurred on pages 192-196. After reading this section I paused for a moment to compare and contrast the life of a black man in the present as opposed to the life of a black man in the past. Upon doing so, I found it quite disheartening that if I were to perform the same comparison on the life of a white man, the two wouldn't even compare in severity. I find it so very upsetting that a black man was not able to drive or check into a hotel without feeling as though his life could be taken from him at any moment. The most notable scene of the southern departures was on pages 186-188. Pershing Foster was leaving Monroe, LA for California. Another person from Monroe, Huey Newton, was the founder of the Black Panther Party in Oakland in 1966. Pershing was not quite sure where in California he would go; he heard that more people form Monroe were in Oakland than in LA. I liked this passage because it shows that starting a new life may not be so simple, especially when you don't know a specific destination. One of the most memorable departures was from Monroe, Louisiana to California. One of the most notable parts was the story of Bill Russell's parents and the events that lead up to them leaving Louisiana(p 187). If Russell's parents decided to stay in Monroe, his life might have been extremely different than it was. It's fascinating to see how moving out west gave Russell a chance to reach his full potential. The scene concerning southern departures that was the most memorable to me was located on pages 193-196. The struggles Robert Joseph Pershing Foster went through while traveling was just very hard to imagine, especially carrying 25lbs of ice in a bucket as an air conditioner. It was already bad that there were barely to no hotels that accepted colored people, but he had to sleep in the car in these horrible conditions. It is just sad how much we take these little things for granted today. This was one of my favorite parts of the book, I was glad to have read some more information on my fraternity brother Huey P. Newton. Regardless, on pages 192-196 talked about the challenges black people faces when traveling. It’s saddening to think that no one was willing to help you if your car had broken down. I would hate fearing for my life just because of a malfunction of my vehicle. When looking at Foster’s situation there has been some change but the story remains the same. People of color aren’t safe wherever they go. They face the constant fear of police brutality and from random citizens. The nine black elders that were shot and killed in Charleston did not deserve to die but because they were black they were killed. Foster, like most black people today, questioned their safety while traveling. (184) I found it most interesting how they said black people traveled on the car with the baggage. Even though I've heard this before, I still found it intriguing that people paid to be treated like garbage. Like, blacks were good enough to take money from but they werent good enough to be treated equally. I especially found this interesting because my grandmother was once on one of these trains, traveling with the luggage. The most notable story that I read was that of George Swanson Starling. The part that was most interesting is on page 192. The image of a man being stuffed in a train car with other families, that were all under horrible conditions was touching. His story of having no choice but to run to the north, unsure if life was going to be better, was somewhat unimaginable to me. Yet, I know that this experience was not unique during the time. The feeling of the not knowing is a difficult one, but just as George had no alternative many other did the same. On page 197 the author stated that even on the trip leaving the south, there were humiliations that could still break your spirit. These situations must have been so humiliating, to the point where freedom no longer brought joy. The same page stated that blacks were expected to ride the entire trip without food (which is ludicrous). Conditions were just horrible in that time period and new laws were a step in the right direction, but we were not anywhere close to where we needed to be as a society. On pages 188-89, Wilkerson explains the significance of a name and how it was one of the only things parents could provide their kids in most cases. However, it was very interesting how Robert Joseph Pershing Foster chose to abandon one of his middle names, Pershing. This need to distance himself both physically and emotionally from his past in the South really amplified how important it must have felt to finally leave and pursue a better life in California. The most memorable would happen to be the story of Huey Newton and his sharecropper. I have a bias because Huey Newton is one of my favorite activists. What's interesting is perhaps what his militant attitude derived from. His Dad escaped a lynching which could have had a heavy impact on his style (Wilkerson 187). I found the scene described on page 195 most memorable. In this scene, the author discusses being stranded in a white area and the constant fear of being killed. This is so disheartening to think about; how something so simple as being on the street could place panic in the heart of a man who has down nothing wrong. This passage made me reflect on how the circumstances have improved, but also understand that many black people, particularly men, do not feel safe because of the color of their skin. The most memorable part to me was on page 184 and again on 190 where Ida Mae talks about leaving everything and everyone shes's ever known behind. She had never been out of Mississippi before and then to board a crowded train car to a place you have never been before, where you know no one. This really stood out to me because I can only imagine what she felt leaving everything behind in hopes of a better life for her and her family. On Page 184 the author describes a scene where Ida Mae and her family left Chickasaw County Missisippi. I found this scene the most memorable because although they were poor and pretty much spent all their resources to get the train tickets, they still had to ride with the luggage just so white people could feel superior. The harshness of southern departures was much worse than it was made out to be. Ida Mae speaks of how most times families wouldn't get the opportunity to even say goodbye to one another, showing how truly savage the idea of departures can actually be (184). I think what is so amazing is the true sense of hope and the great desire they had to leave. Of course anyone in their state would want to get out of there, but with leaving they got to reinvent themselves. They could change their name and to them at that time it was so important. The fact that Pershing wanted to be called Bob for mere simplicity is so fascinating to me (189). I found the story of George Swanson Starling the most memorable because I related to it. I related to the feeling of wanting to escape from ones own people because of their negative sentiments. page 198.